Did you know that a hundred years ago the banks of the River Fowey were laden with apple trees? 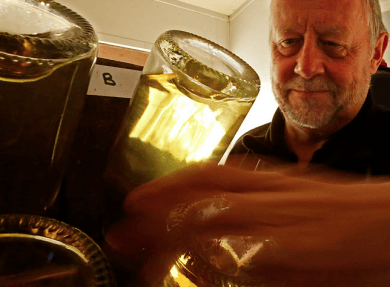 Bringing back the ancient craft of cider making is Barrie Gibson, who has been making cider for the past 15 years – taking the decision to begin selling commercially in 2012. The delicious award-winning sparkling cider is made using the labour intensive Méthode Traditionelle, made famous by champagne crafters in France. Taking two years to produce, the apples are pressed then fermented twice, first in a barrel and then in the bottle – creating a wonderful bubbly effervescence. Alongside sparkling cider, Barrie also produces ‘Fowey Valley Eau de Vie’ - distilled five times it has hints of cherry, apricot and chocolate flavours. If you’re looking for something a little more refreshing we recommend the Fowey Valley Pommeau – a blend of fresh apple juice and the Eau de Vie, a perfect accompaniment to chocolaty puddings. As well as tickling our taste buds in the beverage department, Fowey Valley Cider also produce great products for the kitchen. The vintage cider vinegar is aged for four years before bottling and is perfect for salads, chips and pickling – whilst the extra virgin olive oil, which is characterised by its bright green colour and hints of artichoke, green apple and tomato is perfect for cooking. Fowey Valley Cider’s products are available to buy throughout the county at farmers markets and at a variety of shops – you can find a full list here. Barrie’s Cider chutney – made from Grandma Gibson’s secret recipe it’s bursting with flavour from Fowey Valley’s apples, cider and olive oil – delicious! 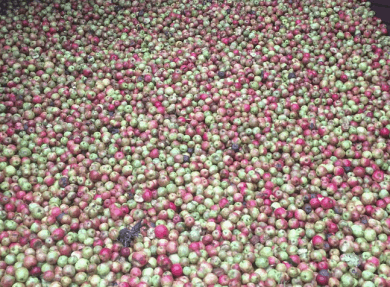 One of Barrie’s cider making courses – topics include an introduction to artisanal cider making, the scientific process and the juice and strain method.